Marinated feta where have you been all my life?! That was basically what my brain was yelling the first time I made this. It was meant to be just an ingredient in garlicky farfalle with marinated feta and arugula (now a fave of mine), but I pinched a little bite while I was cooking the pasta, and my mind was blown. Since then I’ve made it on its own, either for tossing in a salad, for eating on crackers, or for just obsessively snacking on by itself. 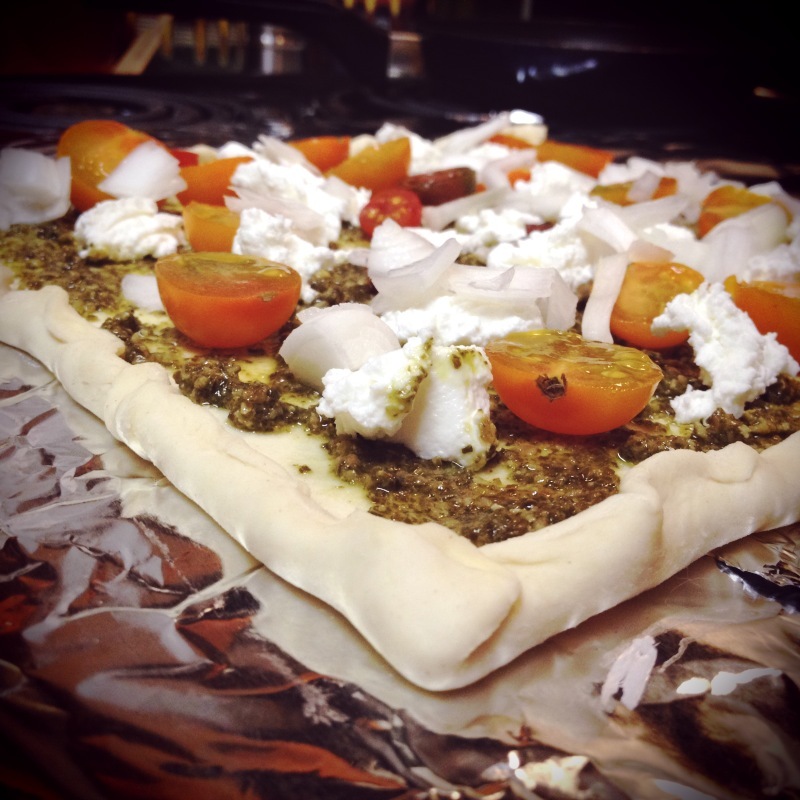 The key to making it especially amazing is to use a really good block feta (not the pre-crumbled stuff). Any block will do—and don’t go fat-free, bring on that fat—but I recently fell in love with the Pastures of Eden feta at Trader Joe’s (and wherever else you can find it). Amazeballs. There are few produce experiences more glorious than a perfectly ripe, succulent peach. Maybe that’s the Southerner that’s always been a part of me, even growing up in the Midwest. More than any other fruit, a sweet juicy peach just screams summer. 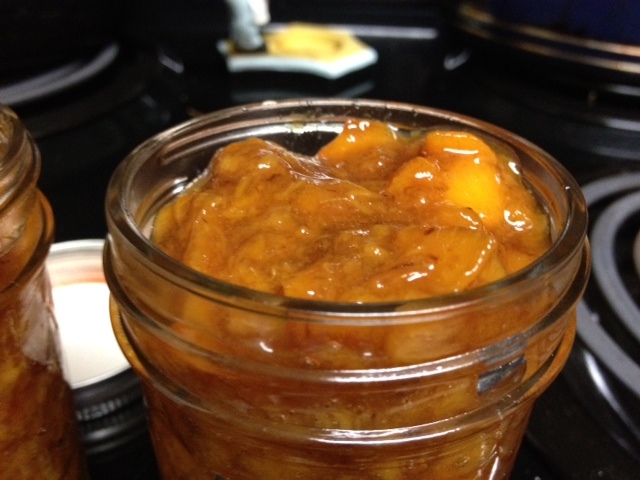 So when I was perusing my local farm stand a couple weeks ago and found some mostly-ripe peaches, I couldn’t resist trying my hand at peach jam. Living down here in Georgia, you’d think getting awesome peaches would be simple. Ironically, South Carolina leads the U.S. in peach production (after California, of course—what DON’T they produce more of??). But because we stuck our flag in the sand, Georgia is inextricably linked with peaches. 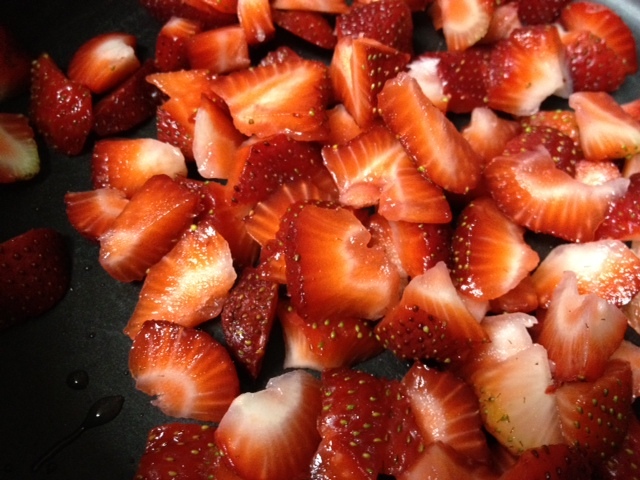 I had successfully made a no-pectin strawberry balsamic jam (simple and delicious!) a few times, so I wanted to branch out to other jam recipes. Problem was, I was having trouble finding pectin-free jam recipes. Fruit butters, yes. But no jams or preserves. So I decided to make one up. 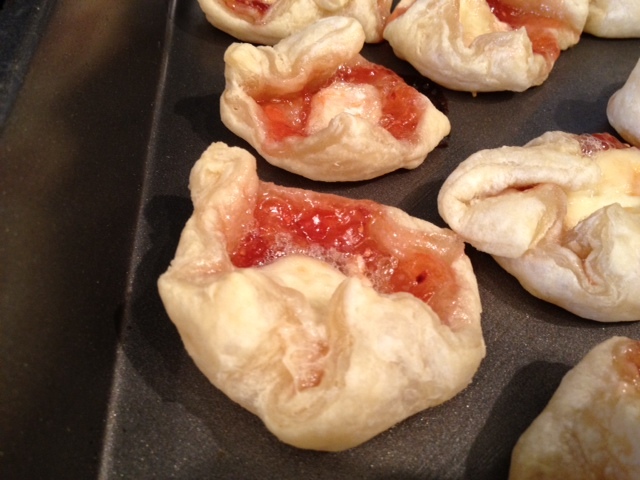 I read several different peach preserves recipes, and also somewhat replicated my strawberry jam recipe. Good news—it turned out great! The only issue is that peeling the peaches takes much more work than just cutting up strawberries. But when you’ve got sweet, ripe summer peaches, it’s totally worth it. I’ve been buying natural peanut butter for years, because it’s generally healthier, to avoid trans fats, and overall just tastes good. But I’ve always been frustrated by the whole “stir in the oil” aspect of it, because I am apparently not capable of doing that. I start trying to stir it, splash oil everywhere, get the entire knife messy, and finally give up and put it in the fridge—where the next time I pull it out, there’s a congealed oil slick on top. So I eat half a jar of really oily peanut butter and half a jar of dry-as-a-bone peanut butter. Suffice to say, I’m not a fan of the oil slick component. But I’d never really considered making my own, because that sounded like too much work. Plus, my grandma makes her own and just puts peanuts in the grinder attachment on her mixer, but that just ends up being dry peanut crumblies. 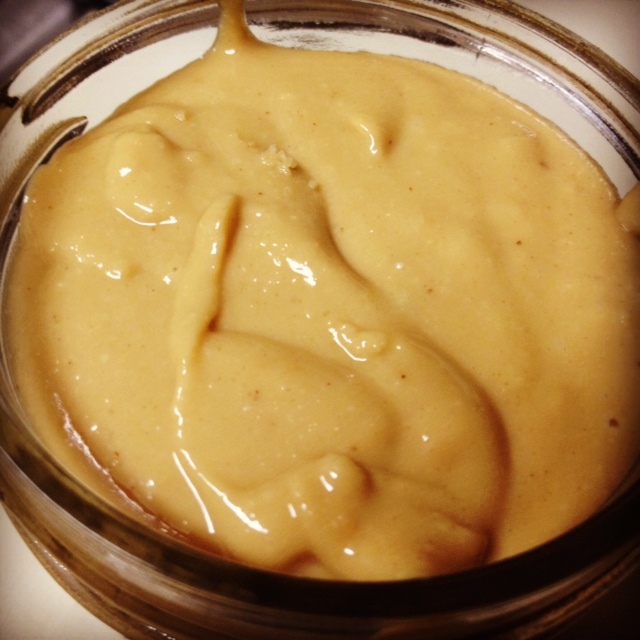 But behold—amazing creamy homemade peanut butter! Enter Pinterest. Someone had pinned instructions for making your own with just the peanuts and a food processor, no additives. They said that if you just kept the food processor running past the crumbly stage and past the “dry ball of peanut goop” stage, magically the oils break down and it becomes creamy and delicious all on its own. No added salt, sugar, oil, etc. I was skeptical, but decided to give it a try. And, miracle of miracles, it works! So now I’m hooked. 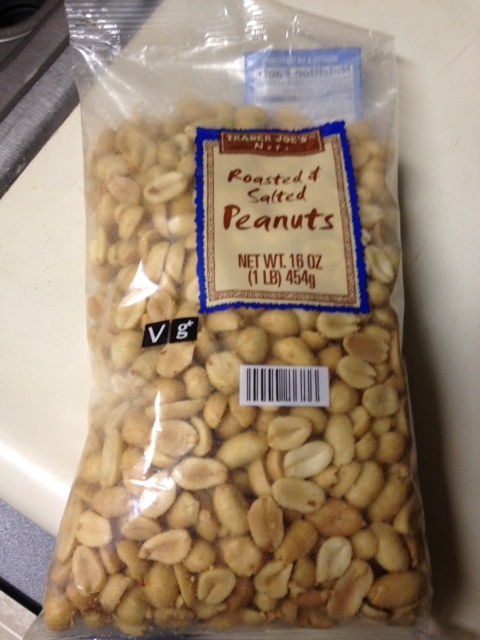 I bought roasted & salted peanuts. Considered using honey roasted, but wasn’t sure of the additional sugar. You can use any type you like, or use mixed nuts, another type of nut, whatever floats your boat. I originally got this “recipe” (in quotes because the word implies consistency) from my awesome friend Casey, who brought it to a Mexican-themed summer get-together we had with friends. I was immediately smitten because it didn’t include 1) green bell pepper, 2) hot peppers, or 3) cilantro. I’m just not that fond of those ingredients, and finding a salsa without them is quite difficult. 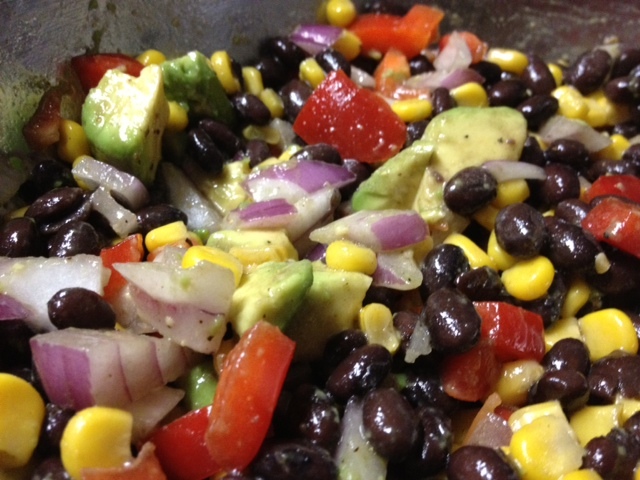 However, that’s not to say this salsa CAN’T include them—its beauty is in its versatility. I’m pretty sure I’ve never made it the same way twice (let’s face it, mostly because I can never remember how). So I’m just going to give you the guidelines and some other thoughts on how to adapt. You’ll have to play around with it to figure out how you like it best. People seriously scarf this, and rave about it every time I bring it somewhere. As I may have mentioned (a hundred times), I went to the Farmer’s Market last Friday after work. I was dumb and forgot my reusable grocery bag, so I just loaded myself up with as much as my little arms could carry. 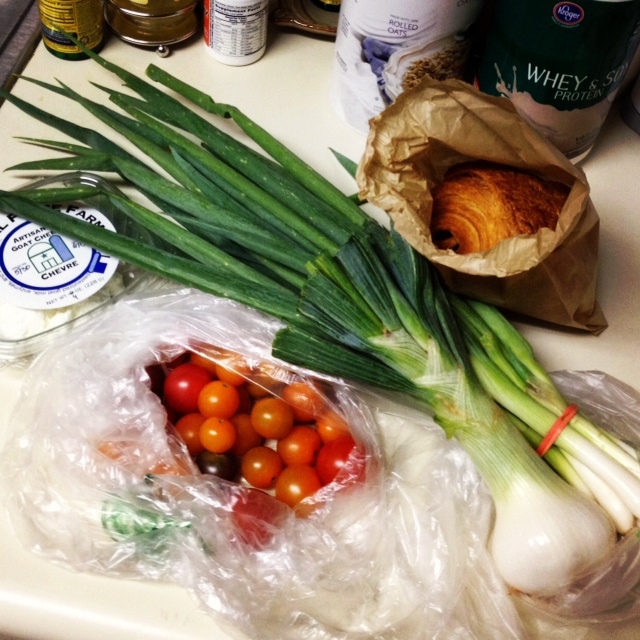 Not a bad haul, for my first try—spring onion, scallions, the best cherry tomatoes I’ve ever eaten, locally-made chevre cheese, and a chocolate croissant. Which I ate for breakfast the next day. So when I started thinking about what lovely delicacies I could make with my new veggies and tasty Georgia cheese, I of course turned to Pinterest, which directed me to this awesome tart. And if there’s one thing you should know about me, it’s that I’m in love with anything involving pie crust (or resembling something with pie crust). Seriously, that was my biggest criteria for what I ate in Ireland last summer (steak & Guinness pie, chicken & mushroom pie…you get the picture). I’m pretty sure I didn’t even know chicken salad existed when I was growing up (now, TUNA salad I was familiar with…). But when I moved to Atlanta and began having catered rep lunches, I fell in love with it. The best part is how many variations there are. There’s regular, Southern-style, with mustard, with curry, Waldorf, just about anything really. We were in Texas visiting family four or five years ago, and my Aunt Tina (who has other amazing talents, like cake baking/decorating) made this chicken salad. It’s in the (Blair) Waldorf family, and is the best chicken salad I have EVER had in my life. The combination of cider vinegar, honey, and white pepper in the dressing is the secret, I think. It’s like crack. Sweet, tangy, mayo-covered crack. A friend of mine posted this recipe on Pinterest a while back, and I was immediately taken. Brie + jam + pastry?? Sign me up! Problem was, I didn’t have a really good reason to make something like this, and if I just made them for myself I would eat them ALL, which is a bad idea. So when I was in Dallas last weekend my friend Kristine and I decided to prepare a big Sabbath dinner for us, her boyfriend and her roommate. I suggested these little pastry brie & jam bites as an appetizer, and she immediately agreed. They were easy, affordable, and–best of all–delicious! Jams and jellies are some of my favorite things. 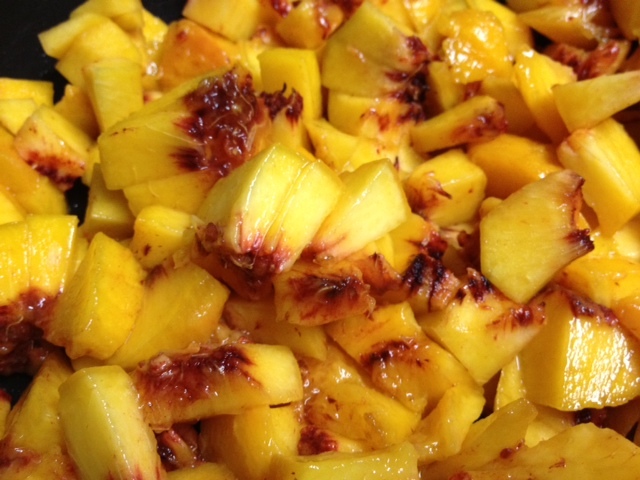 We made some when I was a kid, with whatever fruit we had—peach jam, apple butter, sandplum jelly. But I’ve never tried making it myself. Partly this is because I’m lazy, but also because I’m scared of things I don’t know, like pectin.